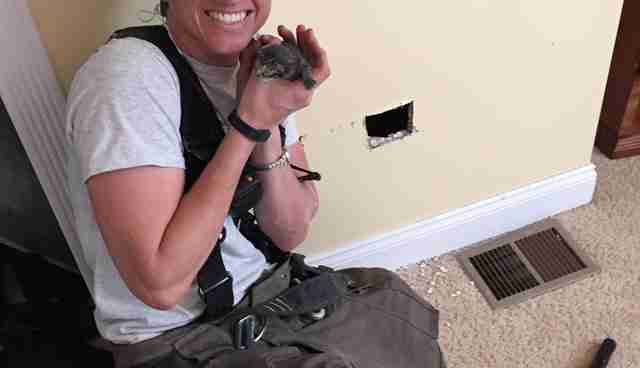 Firefighter Tara Holcomb rescued this tiny kitten twice in one day: first by freeing him from the wall where he was trapped, and then by making him a permanent member of the family. Holcomb, a firefighter in Mount Dora, Florida, responded to a call about an animal trapped inside a chimney on March 30. Unable to see inside the wall, and unsure what she would find, Holcomb reached in to try to get a hold of whoever was trapped there. "My hand landed on a little ball of fur with a thin tail, and my first thought was that I had grabbed a rat!" Holcomb told The Dodo. 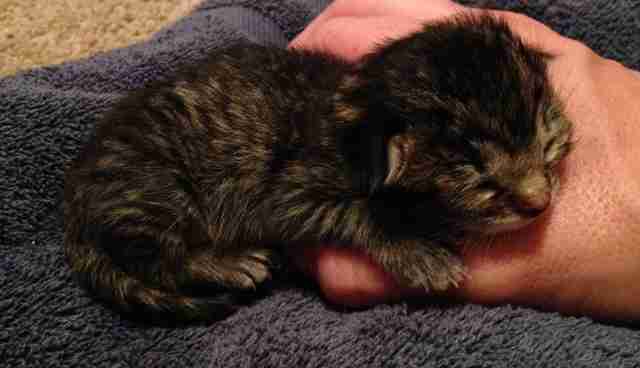 "After reminding myself that I was already holding it, I pulled out this tiny, precious kitten." The little guy didn't even have his eyes open, and Holcomb could cradle his whole body in one hand. After making sure there were no other kittens or a mama cat in the wall too, Holcomb packed up her gear and headed off, leaving the kitten with the homeowners, who had promised to find him a forever family. But she couldn't get the tiny critter off her mind. "That little kitten was all I could think about the rest of the night at work," she said, "and I even thought of a perfect name: Wall-E."
The next day Holcomb asked the family if they had found a home for him yet, and they said no, but that he was hers if she wanted. 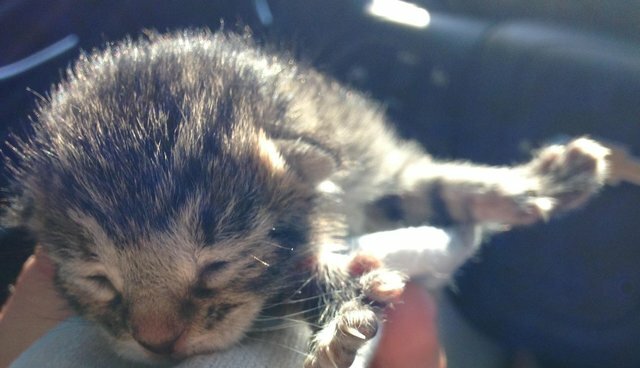 "I immediately turned around and headed home with the little guy sleeping in my lap, nestled inside a sock," she said. Thanks to lots of love and care (and late-night bottle feedings), little Wall-E is doing great. He's growing bigger and making friends with Holcomb's other pets: "Our miniature dachshund Sadie quickly adopted him, licking and snuggling him like one of her puppies." Wall-E isn't the only kitty Holcomb has brought home from her job. She rescued another tiny kitten back in 2013, and couldn't resist adopting her, either. "Our animals seem to have found us, each in their own way, and we are grateful to be able to give them happy homes," Holcomb said. "In return, they give us more love than we could ever ask for!"